When landscaping a property it is important to understand things that could cause unwanted insects or termites. 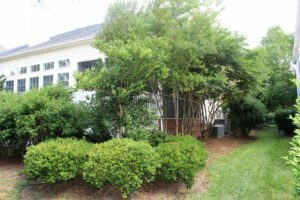 Soil or Mulch Buildup – Excessive soil or mulch against brick walls or siding at the foundation provides a protected gateway for termites to enter a structure by bypassing the treated soil beneath. Raised Foundation Planters – Landscaping plant containers such as flower boxes, planter boxes, and other fixed open planters are often built right up against the house, or are touching an element of construction that is part of the house. Planter boxes may be at grade or raised above it. Sometimes they are simply three-sided boxes with no bottom and using the structure as the fourth side. Termites can move into the planter box from the ground below and then find their way into the structure undetected through direct wood/soil contact, through weep holes in brick, through cracks, or up under the siding. If not protected by flashing, membranes, or poured concrete, foundation planters can provide direct access for moisture, termites, and carpenter ants into a structure. Shrubs, Trees, and Vines Touching Walls – Carpenter ants commonly invade homes by traveling up in trees and shrubs and crossing over to the house where branches are touching the walls or the roof. Vines such as ivy growing on exterior walls also provide access for carpenter ants. Termites may also tube up shrubs and other plants and gain direct entry into a structure if the plants are in contact with the wall. 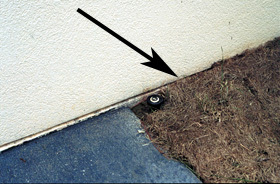 Dense Vegetation – Thick groundcover plants and other heavy vegetation at the foundation wall traps moisture next to the foundation and can provide termites and other to the house. 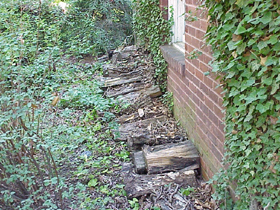 Firewood stored in the home, on the deck or patio, especially if against the foundation wall. Lumber stacked against foundation or inside crawlspace. Landscape timbers or railroad ties in contact with the foundation or other structural elements of the house. 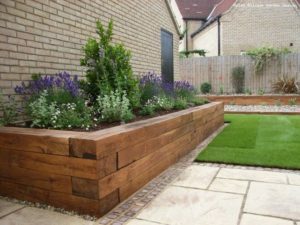 Wooden flower bed borders or fencing (like tiny pickets) that touch the structure.